Arup has collaborated closely with Chetham’s and the design team to deliver a highly flexible concert hall with a truly world-class acoustic and a delightful aesthetic. performances and avoid disturbance from adjacent spaces. The room acoustic of the hall is exceptional for its main uses of chamber music recitals and recordings. This has been achieved through an extremely high level of attention to detail in the design of its geometry and finishes – every surface has been considered and optimised. The design was developed using sophisticated 3D computer modelling and also Arup’s extensive experience in the design of similar halls throughout the world. The acoustic finishes include large areas of various bespoke sound diffusing treatments, including high quality oak sound diffusing panels at low level and low frequency sound diffusing treatments to the upper walls and ceiling. The ceiling was also cleverly designed to be a bespoke ‘panel absorber’ to provide substantial low frequency sound absorption to the space and prevent it from sounding boomy. An innovative variable acoustic system has also been integrated into the design of the hall to enable its room acoustic to be optimised for a diverse range of other events including jazz, conferences and orchestral rehearsals. This system enables acoustic banners to be deployed into the hall at the touch of a button, to dramatically reduce its reverberance. 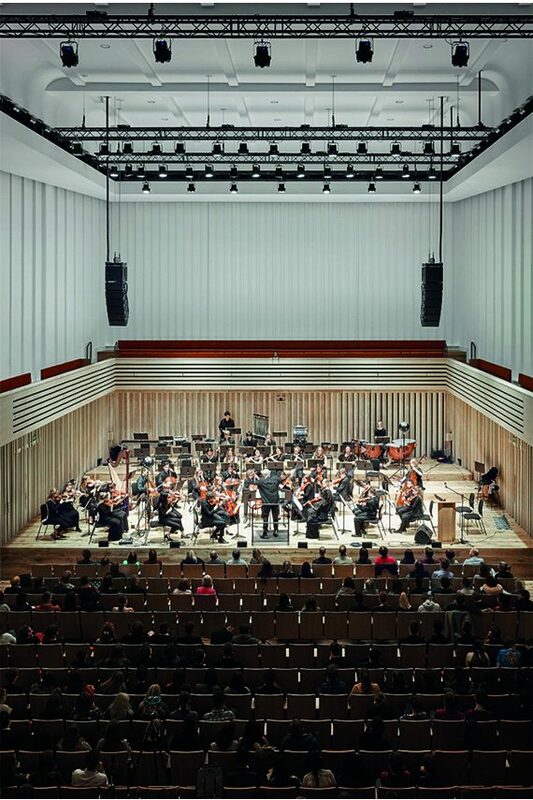 technique, also employed at The Bridgewater Hall, ensures that the interior of the hall is silent – perfect for high quality recitals and recordings. Arup also advised on noise control for the ventilation system and other building services systems to maintain silence even when the hall is fully occupied.